Delivering on its commitment to offer bigger and better scares, ScareLA, the first Halloween convention of its kind, will count with a substantial array of curated and unique exhibits showcasing scary goods and services at the Los Angeles Convention Center on August 5-6. Exhibits will include returning favorites Funeral Classics, Characters Unlimited, Reign of Terror, terrifying escape rooms, music and family-friendly activities and an all-new exhibit from Starburns Industries. Funeral classics will be displaying a Jack Pierce/James Whale Frankenstein Prop head at their booth. Characters Unlimited will be featuring their specialized and affordable designs for life-sized talking characters. Reign of Terror will have a frightening photo op for all attendees. 60out Escape Rooms, Cross Roads Escape Games, and PuzzleMazement will offer terrifying escape rooms that will test the cleverness and agility of all monsters. The best in Halloween music, including LA Fear, Nox Arcana – William Piotrowski and The Rhythm Coffin-Monster Rock n’ Roll. Family-friendly exhibitors including, Broken Oar Productions, featuring “Monster Elementary”, an all-ages comedy adventure graphic novel series created by Nicholas Doan and Caanan Grall. With many more monstrous exhibits and attractions to raise the Halloween spirit. For the first time ever at ScareLA, production company, Starburn Industries (“HarmonQuest”, “Great Minds with Dan Harmon”, “Community”) will feature a dedicated booth where they will create a thrilling exhibit that will incorporate the cutting-edge technology that has elevated them to industry leaders, including stop motion and 2G/CG animation. Tickets for the convention are still available for purchase, but all monsters must act now before quantities die out! 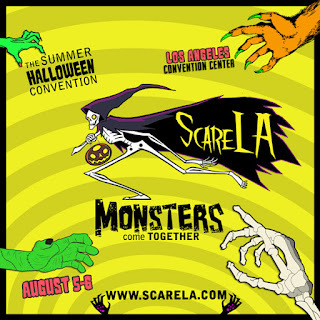 For more information, visit scarela.com.